Flowering Date Early to midseason and repeats later in the season. Flowering Date: Early to midseason and repeats later in the season. Winter Care: Mulch the first winter to prevent heaving due to alternate freezing and thawing winter weather. Flower Form: 6" flower, ribbed and lightly ruffled, flat or slightly recurved blooms. Foliage Type: Strap like medium green. Evergreen. Pruning: Cut back spent flower stems. Soil Requirement: Adaptable to many soil conditions just make sure it is well drained. Additional Information: Hybridizer: Kenneth Durio 1977. Awards-HM 81, AM 84, LAA (Lenington All American Award) 90. 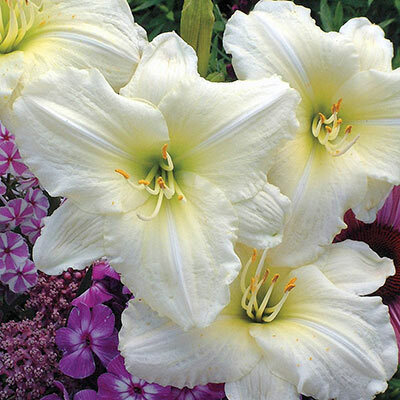 Hemerocallis means "beautiful for a day".